From housework to the legal profession, women enter fields that were male-dominated — but men don’t reciprocate. There is a new review of the state of gender inequality in the U.S. by Paula England. She draws on a database of trends compiled by Reeve Vanneman and colleagues, among other sources, which show a marked stall in the movement of many indicators toward gender parity. 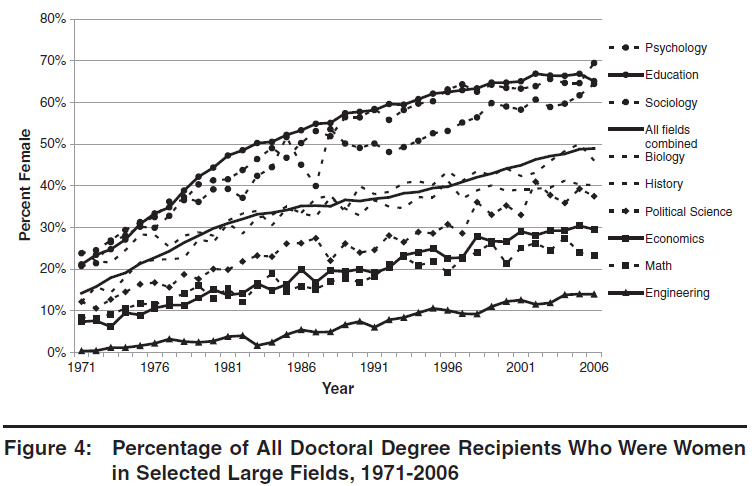 At the doctorate level, women are approaching 50% of all PhDs, but segregation between fields is still dramatic. Engineering, math and economics remain below 30% female (engineering is below 15%), while sociology, education and psychology are becoming female-dominated. 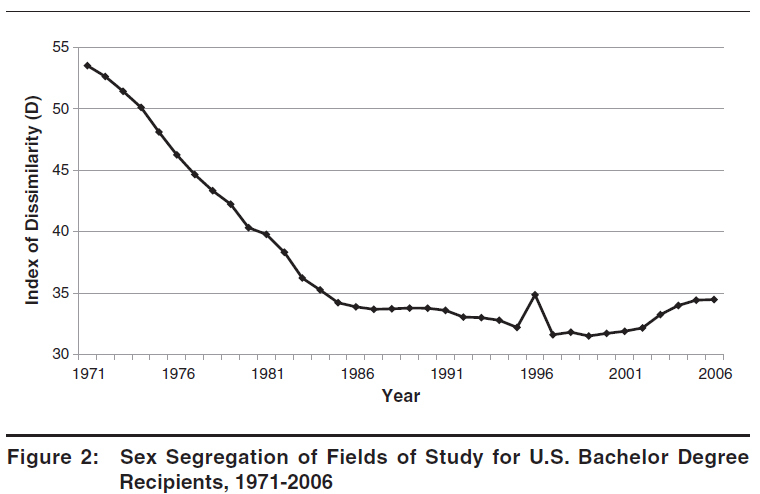 A number of these fields show stalled progress in the last 10 years, especially the most male-dominated. To help explain the general stall, England makes the point that the “gender revolution” — which now appears to have occurred mostly in the 1970s and 1980s, as women closed gaps in earnings, education, housework, managerial representation and occupational integration, and patriarchal attitudes became less pronounced — involved a lot more change on the part of women than it did for men. In particular, women entered formerly-male occupations and educational specialties much more than men entered women’s. That is partly because the cultural stigma that leads to devaluation of female-dominated work remains strong. That lack of reciprocal integration by men — who have added much less housework to their daily routines than women have shed, for example — is contributing to the stall in progress for women.